The living room is encircled in windows and the circular (and very comfortable) couch and wood-burning stove make it cozy and warm. The kitchen, open to the living room, is tiled and a very pleasant place to be. The ceilings are high and beamed and there are sea-theme accents throughout the house. 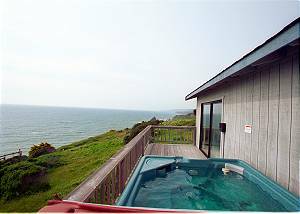 The hot tub is out on the wrap-around deck, accessed from the living room and master bedroom. 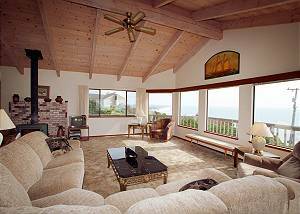 The views from this house, located on the bluffs at the north end of Irish Beach, are smashing.